Aflatoxins are carcinogenic. FAO has declared that 25% of all crops in the world are affected by aflatoxins. Countries in Africa have lost their export markets as a result. It affects the absorption of other nutrients thereby causing malnutrition. Aflatoxin was discovered in the 1960s. Regulatory limits were enforced in 1980. Aflatoxin is a poisonous substance produced by mould fungi (Aspergillus flavus and A. parasiticus) that can grow on poorly managed agricultural crops, particularly groundnuts. If eaten in sufficient quantities, aflatoxin can cause serious sicknesses that can lead to liver and several other cancers. Groundnuts for sale and export should be free from aflatoxin. Therefore appropriate crop management is essential at pre- and post-harvest times. Aflatoxin is carcinogenic and can cause liver and other cancers in humans. It increases incidents of hepatitis viruses B and C.
It lowers the body’s normal immune response to invasion by foreign substances. It impairs growth in children, notably in Africa, and causes childhood cirrhosis in India. In poultry and livestock, aflatoxin can cause feed refusal, loss of weight, reduced egg production, and contamination of milk. The Center for Disease Control has estimated that more than 4.5 billion people in developing countries are chronically exposed to aflatoxins in their diets. Effect of storage conditions on quality and aflatoxin contamination of peanuts (Arachis hypogaea L.). Aflatoxin contamination of food commodities and their management. Occurrence of Aspergillus species and aflatoxin contamination in raw and roasted peanuts from formal and informal markets in Eldoret and Kericho towns, Kenya. Peanut contamination by Aspergillus flavus and aflatoxin B1 in granaries of villages and markets of Mali, West Africa. Reducing aflatoxins in groundnuts through integrated management and biocontrol. ELISA: An inexpensive and highly precise tool for estimation of aflatoxins. Assessing occurrence and distribution of aflatoxins in Malawi. Incidence of aflatoxin in peanuts (Arachis hypogaea Linnaeus) from markets in Western, Nyanza and Nairobi Provinces of Kenya and related market traits. Occurrence and distribution of aflatoxin contamination in groundnut (Arachis hypogaea L) and population density of Aflatoxigenic Aspergilli. Importance of mycotoxins in food and feed in India. Effect of irrigation interval, planting date, and cultivar on Aspergillus flavus and aflatoxin contamination of peanut in a sandy soil of Niger. Aflatoxin B1 contamination of groundnut (Arachis hypogaea L.) in eastern Zambia. Resistance to preharvest aflatoxin in ICRISATs minicore collection. Understanding and managing aflatoxin contamination in the groundnut value chain in Nigeria. A Case for Regular Aflatoxin Monitoring in Peanut Butter in Sub-Saharan Africa: Lessons from a 3-Year Survey in Zambia. 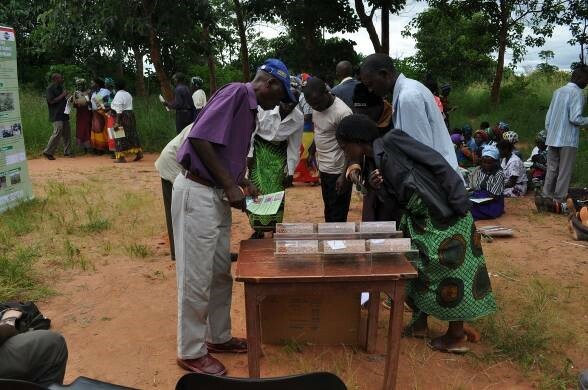 in foods among members of the general public in Malawi. Aflatoxins: Finding solutions for improved food safety. Projects were undertaken on improving groundnut breeding systems for drought tolerance and disease tolerance in West and Central Africa. This included several projects addressing regional priorities identified by Conseil Ouest et Centre Africain pour la Recherche et le Développement Agricoles/West and Central African Council for Agricultural Research and Development (CORAF/WECARD), and implemented by national agricultural research organizations in collaboration with ICRISAT. 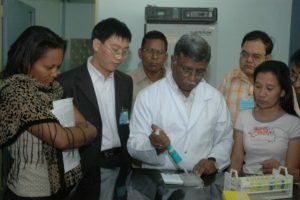 ICRISAT developed a strategic plan for aflatoxin research that included genetic enhancement and management approaches. In terms of genetic enhancement, the development of cultivars with enhanced resistance would provide an effective complementary approach to control aflatoxins in groundnut. Since aflatoxin contamination is invisible in commodities, the key is detection. 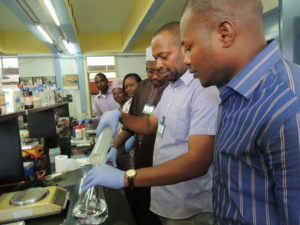 In the face of high testing costs constraining the development of new resistant varieties and integrated management technologies that were unaffordable to farmers in developing countries, scientists at ICRISAT devised a fast, simple and affordable test kit for aflatoxin detection. The kit uses a competitive enzyme-linked immunosorbent assay (cELISA) which cuts the cost of testing crops from US$ 25 to $1 per sample. The results obtained using cELISA are comparable with that of highly sensitive HPLC results. The kit can be used in even the most remote rural farms to monitor grains and nuts and improve storage techniques to avoid serious contamination. Its advantage is that most of the required chemicals are locally available in developing countries and it allows the analyses of up to 200 samples per day. 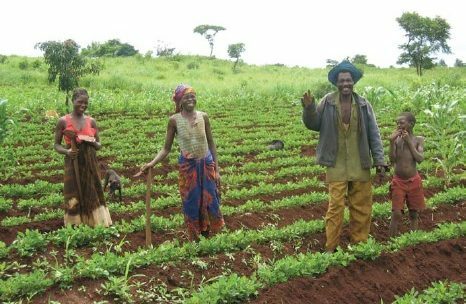 The National Smallholder Farmers’ Association of Malawi (NASFAM) successfully used the technology, in conjunction with HPLC, as part of a broader effort to regain its once-lucrative European groundnut export market. The kit was also promoted with partners in Mali, Niger and Nigeria. 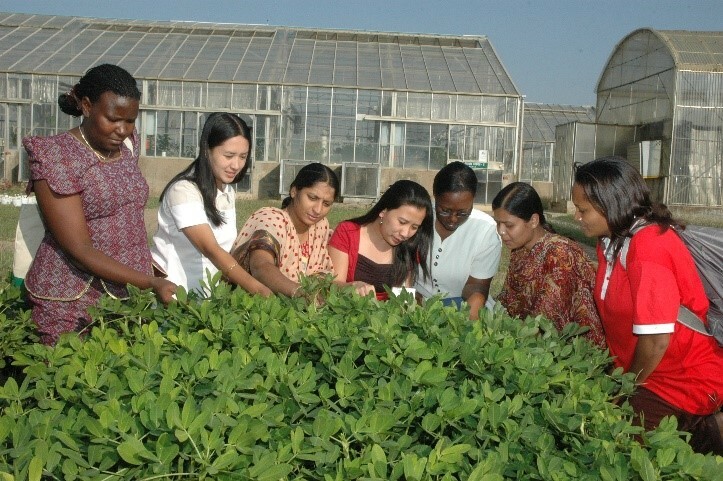 The test provided a unique opportunity for ICRISAT and its partners to conduct field studies to select breeding populations, to develop pre- and post-harvest management technologies and to discover dietary sources of aflatoxin, thereby stimulating interventions that enhance safety of food and human health, trade, and ultimately farmers’ income. Vimala Feeds Private Limited, a large poultry feed factory near Hyderabad, was forced to buy groundnut cake from growers hundreds of kilometers away because of high aflatoxin levels in the groundnut cake purchased from local farmers. The only alternative was to analyze each packet of cake for aflatoxin through thin layer chromatography (TLC), an expensive and time consuming process. Transporting the groundnut cake over long distances was cheaper. ICRISAT’s ELISA package changed everything. ELISA tests cost about a dollar, while TLC costs three times that amount. The end result was that Vimala spent less on transport and could process its feed production faster. Moreover, neighboring farmers were able to sell their groundnut cake to Vimala instead of watching the cash fly off to farmers in other states. The National Small Farmer Association of Malawi (NASFAM) and ICRISAT have established collaboration for testing the groundnut produced by the farmers. Based on the level of aflatoxin contamination, NASFAM graded groundnut lots into permissible (20 µg kg-1) amounts. Graded groundnut lots found favorable markets for regional and global export, benefiting the farmers. The aflatoxin-testing laboratory in Malawi contributed to the revival of groundnut exports to Europe and South Africa from that country. 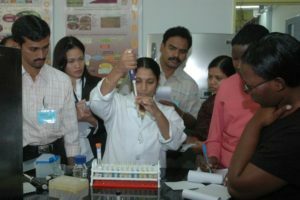 A 2-day scientific meeting on “Strategies for reducing aflatoxin levels in groundnut-based foods and feeds in India – a step towards improving health of human and livestock” was held at ICRISAT-Patancheru, 26-27 July, 2000. The meeting gave an opportunity to the main partners of a Project funded by the Department for International Development/Natural Resources Institute (NRI), UK, to address the research and development aspects of the problem of aflatoxins in groundnut. Participants included experts from the University of Reading, UK, Acharya N G Ranga Agricultural University, National Research Centre for Groundnut, and ICRISAT with representatives from non-governmental organizations and development agencies such as Man and Ecology (AME) and the Society for Transformation Agriculture and Alternatives in Development (STAAD) as well as from Janaki Feeds, Hyderabad. 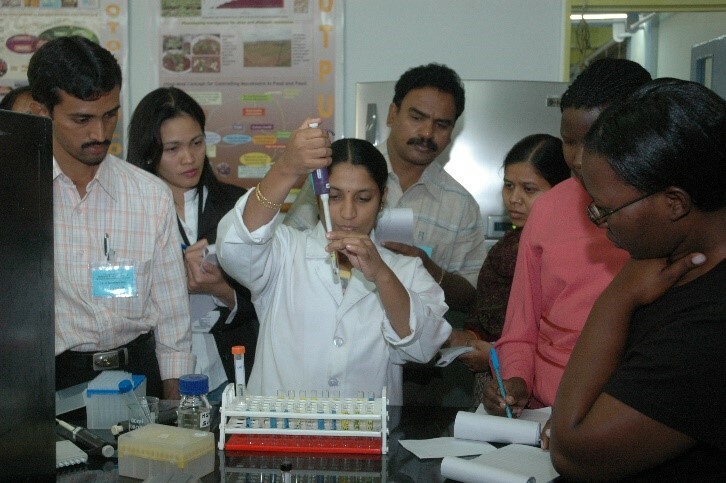 The Government of Andhra Pradesh in India funded the setting up of the aflatoxin laboratory as well as other laboratories in the state, through the Agri-Science Park at ICRISAT. Research showed that the aflatoxin exposure in Ghana is enough to suppress immunity – so fears that this toxin is a factor in infectious diseases where confirmed. A number of technologies such as tolerant varieties, soil amendment using farmyard manure (FYM), crop residues and lime and best bet harvesting and drying techniques were tested on farm in two regions of Mali to minimize aflatoxin contamination by A. flavus. 8 resistant/tolerant cultivars evaluated by 10 farmers in 5 villages of Kolokani under their own management practices recorded significantly lower levels of aflatoxin compared to the susceptible check. In Kolokani and Kayes, application of lime and farmyard manure (FYM), significantly reduced aflatoxin contamination, especially in the susceptible cultivar. The application of lime alone reduced aflatoxin by 79% and the application of FYM reduced the aflatoxin content by 74%. Harvesting and drying techniques such as avoiding damage to pods, harvesting at right maturity, proper drying of pods demonstrated led to 69-88% aflatoxin reduction in Kolokani and 63-84% in Kayes. Together, these technologies contributed to healthy groundnut production – aflatoxin reduction ranged from 70-84%. 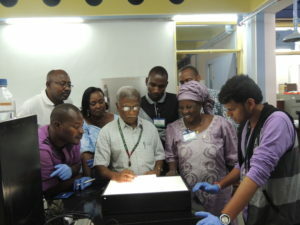 The technologies were scaled out in Nigeria and Senegal. In the groundnut growing belt of Andhra Pradesh, high-yielding, short-duration groundnut advanced breeding lines with resistance to in vitro seed colonization (IVSC) to Aspergillus flavus were tested in farmers’ fields from 2003 to 2006 with an objective to identify superior agronomic performance coupled with low aflatoxin risk lines. Six lines with low aflatoxin risk (up to 73% reduction in pre-harvest aflatoxin contamination) such as ICGVs 91341, 93305, 91278, 91328, 94379 and 94434 were identified. This exercise was part of a project to improve the livelihoods of poor farmers through better access to aflatoxin reducing strategies. 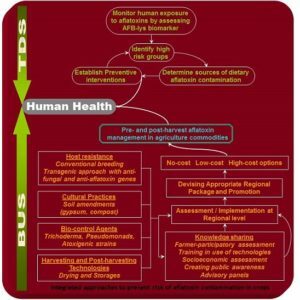 Among the issues addressed were lack of awareness of aflatoxin or aflatoxin-reducing technologies among farmers and processors; reluctance to adopt technologies if they increase costs or, equally importantly, drudgery; and lack of incentive mechanisms in the market to encourage the production of aflatoxin-free produce. Aflatoxin awareness programs involving farmers, NGOs, oil millers and traders, were organized through field days in the villages. Flyers, newspaper articles in the local language, radio broadcasts and TV programs were used to manage and reduce contamination. 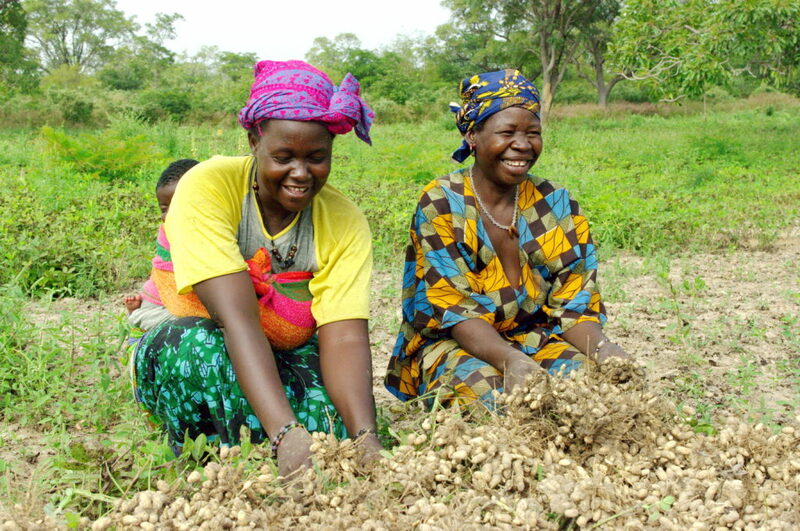 The project on aflatoxin risk early warning system aimed to improve nutrition, health and income in West African smallholder farms in Mali, Ghana, Niger through the development of a groundnut aflatoxin risk prediction and mapping system. It highlighted the scarcity of historical aflatoxin data, which could quantify the actual role of environmental drivers on contamination patterns in smallholder conditions. Extension activities significantly raised public awareness on aflatoxin and its harmful effects. Partners: ICRISAT; University of Sherbrooke, UdS; Cartel, University of Florida; Institut d’economie rurale (IER, Mali); Savanna Agricultural Research Institute, AGRHYMET, Niger. Activities centered around strengthening existing work on foliar disease resistance breeding in Malawi; building capacity with the Tanzanian national agricultural research organizations to select resistant lines, engaging farming communities in the breeding and selection process and piloting local groundnut seed initiatives. Aflatoxin B1 (AFB1) is a frequent contaminant in several foods (e.g. groundnut, maize, chillies, etc.). Human exposure to it occurs through dietary intake of aflatoxin contaminated food. AFB1 heightens the risk of liver cirrhosis and hepatocellular carcinoma, particularly in individuals affected with hepatitis B virus. When aflatoxin enters the body through contaminated food, it is metabolized into aflatoxin epoxide which tends to bind with the lysine amino acid of the protein albumin and forms aflatoxin-albumin adduct. Therefore measuring aflatoxin-albumin biomarker helps to quantify aflatoxin exposure. As part of its aflatoxin management strategy, ICRISAT produced polyclonal antibody to detect aflatoxin-albumin biomarker in blood using a simple indirect competitive (IC)-ELISA for quantitative estimation of AFB1-lys adducts in human serum albumin. IC-ELISA was validated by testing 250 blood samples that include 85 HBV positive samples from unidentified subjects from the Apollo Health City, Hyderabad, and 165 blood samples collected from ICRISAT campus, Hyderabad. Malawi’s status in the 1970s as a major groundnut exporter was eroded by aflatoxin outbreaks. Innovative Communication Media and Methods for More Effective Aflatoxin Mitigation in Groundnut (ICMM), a communication project on aflatoxin mitigation funded by the McKnight Foundation assessed the role of communication in influencing the process of change that leads from awareness to understanding, to desirable, sustainable action to reduce aflatoxin exposure in these countries. 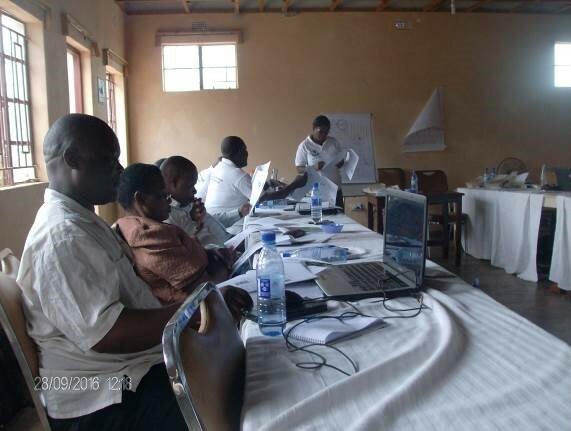 The project used an informal Learning Alliance Approach and also tested the effectiveness of leaflets, radio and video in increasing awareness and understanding on aflatoxin mitigation and management. The result was increased understanding of mould so as to decrease exposure to aflatoxin and improve the health and incomes of the various stakeholders along the groundnut value chain. View a video that highlights pre-harvest interventions as narrated by farmers who implemented them and their efficacy in reducing aflatoxin contamination. A 3-year comprehensive analysis of aflatoxin contamination in peanut butter was conducted in Zambia, sub-Saharan Africa. The study analyzed 954 containers of 24 local and imported peanut butter brands collected from shops in Chipata, Mambwe, Petauke, Katete, and Nyimba districts and also in Lusaka from 2012 to 2014. Results showed that in 2013, 80% of the brands were contaminated with AFB1 levels >20 µg/kg and ranged up to 10,740 µg/kg. Compared with this data, 53% fewer brands in 2014 had aflatoxin B1 levels >20 µg/kg and ranged up to 1,000 µg/kg. An aflatoxin testing laboratory in Zambia is currently operational and provides service to stakeholders. As a result of the work in Zambia on peanut butter, peanut butter processors are now testing their product. One company has started labelling their product as ‘tested for aflatoxins and safe for consumption’ and the Zambia Bureau of Standards is in the process of establishing a National Standards for aflatoxin in peanut butter. View a video that highlights the interventions and shows the Eastern Province Farmers’ Cooperative how to sort and reduce aflatoxin, enabling them to export groundnuts. Carried out as part of the CGIAR) Research Program on Grain Legumes and also as part of CGIAR Research Program on Agriculture for Nutrition and Health. Sequence characterized amplified region (SCAR) markers are one of the most accurate tools of identifying a selective microbe and tracking its populations in a particular environment, adding substantially new information and knowledge to the domain of the subject. Success was achieved for the first time in developing aflatoxin biosynthetic gene cluster-derived SCAR marker to differentiate a particular toxigenic strain from another. This will help in understanding the population biology of a particular toxigenic strain (AF 11-4) in groundnut crop soils, which is very important for developing field screening techniques to identify resistant sources to A. flavus. Donor: Science and Engineering Research Board, Department of Science and Technology, Govt. of India. 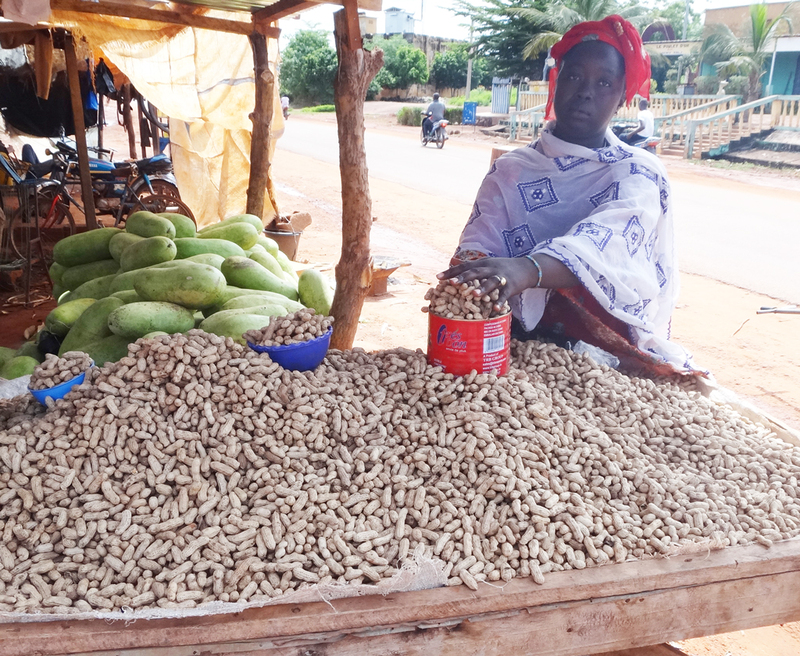 ICRISAT, together with the Institut d’Economie Rurale (IER), helped farmers produce quality groundnut, free of aflatoxin, to enhance household consumption as part of a project with the Aga Khan Foundation in Mali. 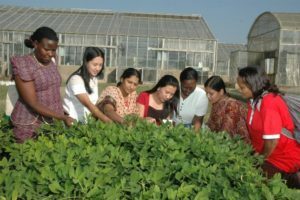 ICRISAT supported groups of women to produce improved aflatoxin-free groundnut varieties to be used to make a biofortified version of the local dish di-dégué, developed into a product known as Equinut. Di-dégué is a food recipe based on existing local products in the food habits of people in rural areas of Mali. This led to developing five varieties of groundnut resistant to contamination by aflatoxin fungi and integrated management practices introduced in groundnut-growing areas in rural districts of Kita (Kayes region) and those of Mopti and Djenné (Mopti region). Participants of the workshop on quality groundnut seed production held at ICRISAT-Kano, Nigeria. More than 700,000 hectares of groundnut worth US$250 million were destroyed in Nigeria by rosette in 1975. Additional epidemics affected the region in 1983, 1985 and 1988. These persistent onslaughts forced millions of farmers to switch to cereal crops and cowpea. As part of the Nigerian Government-funded project “Rebuilding the groundnut pyramids: boosting farmers’ income through new groundnut varieties, cropping systems and processing technologies in Nigeria” implemented in 15 states, a workshop was held at ICRISAT-Kano, Nigeria to enable farmers to grow improved varieties of groundnuts with more resistance to diseases, higher export market demand, and better aflatoxin management to prevent contamination. A revival of the vibrant groundnut industry would help generate employment opportunities and improve the livelihoods of millions of Nigeria’s smallholder farmers. 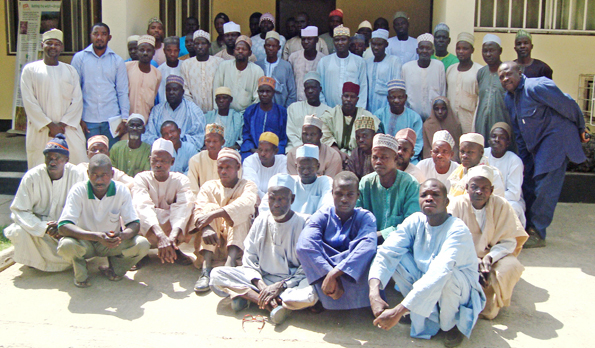 Organized by ICRISAT-Kano, the Kano State Agricultural and Rural Development Authority (KNARDA), and the Kano State Ministry for Local Government and Women Farmer Advancement Network (WOFAN), the workshop sought to enable farmers to produce seeds of improved varieties in the dry season (January-May). 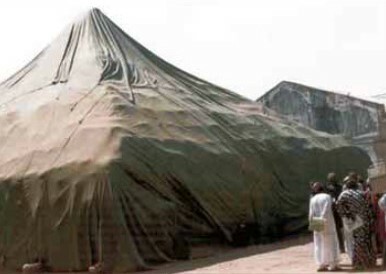 This groundnut pyramid in Kano is a testimony to the fact that Nigeria was once a major groundnut exporter. 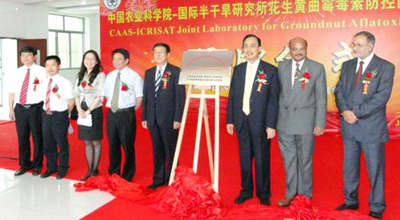 A joint Chinese Academy of Agricultural Sciences (CAAS)-ICRISAT laboratory for groundnut aflatoxin management was inaugurated at the Oil Crops Research Institute (OCRI) of CAAS, Wuhan, China. The collaboration facilitates the producing of drought-tolerant and aflatoxin-free groundnuts as part of the CGIAR Research Programs on Grain Legumes and Agriculture for Nutrition and Health (A4NH). As part of capacity building activities, a three-day international workshop on “Management of groundnut diseases” was organized on 12-14 May 2014 by ICRISAT and the Chinese Academy of Agricultural Sciences (CAAS) in Hanoi, Vietnam in which groundnut researchers devised strategies to combat regionally important soilborne diseases and aflatoxins. More than 90% of the 1000 farmers surveyed in India do not know about the ill-effects of aflatoxin contamination and management options available. This was the results of a survey ICRISAT conducted in the important groundnut growing states of India such as Andhra Pradesh, Gujarat, Karnataka and Tamil Nadu. One of the reasons for poor adoption of aflatoxin management interventions is lack of awareness among the farming community about this menace. Other important interventions included identification of “Good Agricultural Practices” (GAPs) which significantly reduce pre- and post-harvest aflatoxin contamination. Tremendous progress was made in this area. 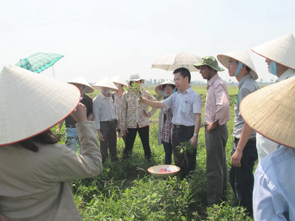 Several technologies were identified, packaged and tested on-farm, such as soil amendments (eg. farmyard manure, lime, and gypsum), moisture conservation techniques, pod drying methods and storage methods. AF Ecology Centre, Anantapur, Andhra Pradesh, India. ICAR-Directorate of Groundnut Research, Junagadh, Gujarat. Acharya N.G. Ranga Agricultural University, Hyderabad. University of Agricultural Sciences, Raichur, Karnataka. Tamil Nadu Agricultural University, Coimbatore, Tamil Nadu. The primary aim of the project is to associate molecular variation with resistance to pre-harvest aflatoxin contamination on a genome-wide scale. 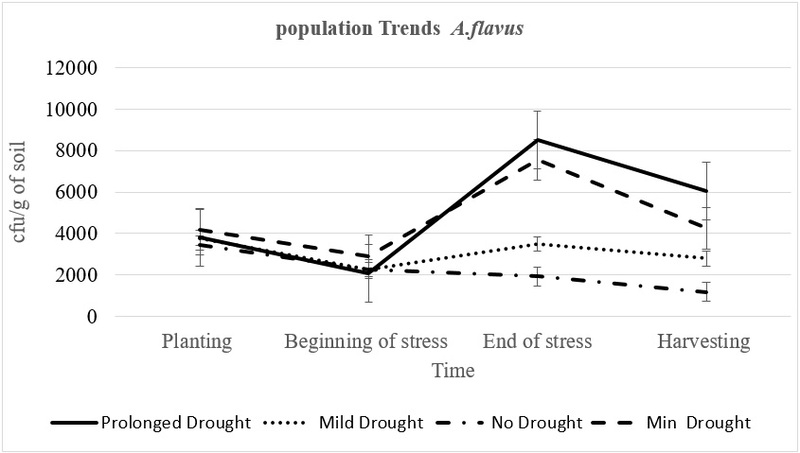 Aflatoxin which presents itself under heat and drought stress could be prevented by irrigation. However, irrigation is not available in areas that suffer the most from contamination. There is evidence that wild species can be used to broaden the genetic base of cultivated peanut for complex traits including disease resistance and drought tolerance. 80% of the trained farmers adopted better drying methods, such as the Mandela cork for groundnuts. Six-fold increase in awareness (with 92%) was observed among farmers using the handling methods. Mothers from Mlali, Moleti, Chetigo and Laikala were trained on post-harvest crop management, utilization of locally available cereals and legumes combinations to make complementary food and on practising good hygiene. 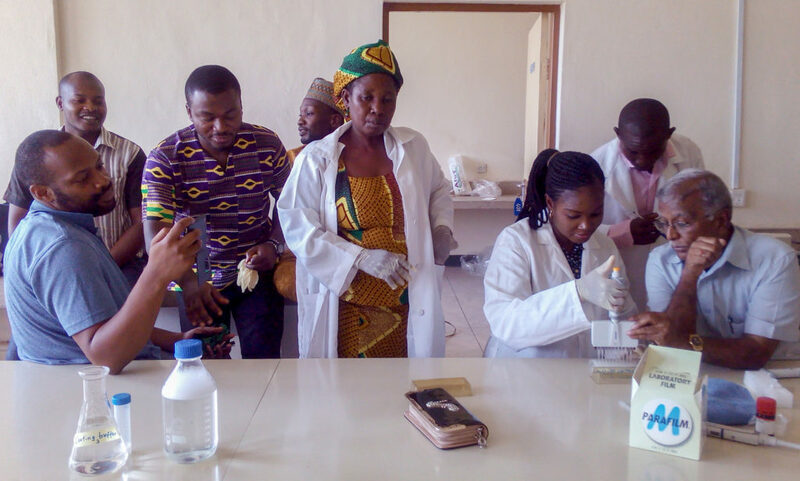 Five technicians from ARI-Hombolo and Sokoine University of Agriculture (SUA) were trained to use the aflatoxin detection capacity established in SUA. It is currently used for testing aflatoxin from crop samples and testing aflatoxin biomarker in urine samples as part of nutrition activity. ICRISAT to continue to provide technical backstopping to SUA, including support to use the lateral flow device in the field testing of the samples as part of mitigation at household level. Mothers with 5-6 month-old children were recruited (100 each in 2014-2015 and 2015-2016) to study the impact of safe cereal-legume based complementary food and hygiene on their growth The gender inclusive baseline was conducted along with the collection of crop samples, urine samples for aflatoxin testing and anthropometric data to understand the undernutrition status of the children. The results showed very poor dietary diversity; >30% children were stunted; > 20% children were underweight; and > 10% children were wasted. Complementary food recipes for children below 5 years were developed using maize, finger millet, pigeonpea and soyabean. Mothers were trained intensively for 21 days on post-harvest crop handling, preparation and adequate feeding of children and hygiene. Follow up data collection and feeding trials were continued for 3 months to understand the impact of intervention on stunting. Data revealed significant reduction in underweight, stunting and wasting status. The nutrition team participated in the Nane Agricultural show to exhibit complementary food recipes, train on recipe formulation and how to improve child growth. The aim of this work is to isolate Aspergillus flavus and Aspergillus parasiticus mainly from peanut growing areas, and determine the genetic diversity of the aflatoxin synthesis cluster in the isolates, in order to feed that information back into the design of RNAi molecular constructs. Partners : USDA-ARS NPRL (National Peanut Research Lab-Georgia, USA). The ability of farmers to produce high-yielding, high quality peanuts with low aflatoxin levels is still quite low. Improved cultivars are available, but the lack of an effective seed program limits availability. Limited marketing due to high aflatoxin contamination levels further reduces farmer incentive to implement current production recommendations and limits commercial processing and marketing. The project addresses a wide range of production, post-harvest handling, and processing issues relative to peanut in Malawi, Zambia, and Mozambique that can impact aflatoxin contamination levels, yield, and profitability. The broad, interdisciplinary research and technology approach starts with cultivar selection and production through the entire value chain including post-harvest storage, processing, and marketing, taking advantage of improved germplasm already available, in country aflatoxin testing equipment and technicians already in place, key production, processing, marketing, and technology transfer partners. Moisture stress experiment to determine the effect of different moisture stress levels, during plant maturation on aflatoxin contamination. The trial was planted on 22 October 2015 and harvested 10 February 2016. Groundnut covers about 316,000 ha and serves more than 300,000 households in Tanzania and Malawi. The potential area for the crops is however 780,000 ha, indicative of the opportunity to double production by expanding crop area and productivity. The main challenges include biotic (diseases/pests and aflatoxin contamination), abiotic (drought), socio-economic, and institutional challenges. The project aims to improve production and productivity of groundnuts as a grain legume that delivers nutrition, food security and improved incomes of smallholder farmers. Development of resilient and nutritious genotypes, testing and promotion of sustainable intensification production systems and strengthening aflatoxin management from households to markets through evidence, diagnosis and knowledge dissemination. Select agro-ecologies characterized identifying the major cropping systems to better understand the deployment of crops species in a way that will influence the adoption of groundnuts. Conducted farmer participatory agro-ecological intensification trials (legume-legume and legume cereal); farmer preferred combinations identified and will be promoted in targeted agro-ecologies of Malawi and Tanzania. Partners: International Crops Research Institute for the Semi-Arid Tropics (ICRISAT), National Smallholder Farmers’ Association of Malawi (NASFAM) – Malawi; Kamuzu Central Hospital (KCH), Ministry of Health-Malawi; Department of Agriculture, Ekwendeni Mission Hospital-Malawi; Department of Research and Training (DRT) of the Ministry of Agriculture and Food Security – Tanzania; and Sokoine University of Agriculture (SUA)-Tanzania. A baseline study carried out in 2015 revealed the presence of aflatoxin biomarker AFM1 in the urine samples of study group children indicating that more than 60% of them were exposed to aflatoxin contamination. Following the baseline survey, a study group of 50 children each, in the 2 districts of Mzimba and Balaka in Northern and Central Malawi respectively, and 70 children from 5 villages of the Dodoma Region in Tanzania, were selected, to test the impact of nutritious food, hygienic practices and controlling aflatoxin contamination, on malnutrition and stunting among children. The project addresses issues pertaining to quantity of aflatoxin that results in stunting among children; effect of different levels of hygiene on health and stunting; and nutrient levels in crops and its impact on stunting. Studies are planned on each of these components through different intervention groups. Bioavailability studies will also be carried out. Investor: McKnight, Africa RISING (USAID) and Irish Aid is a project which started now to expand this work. 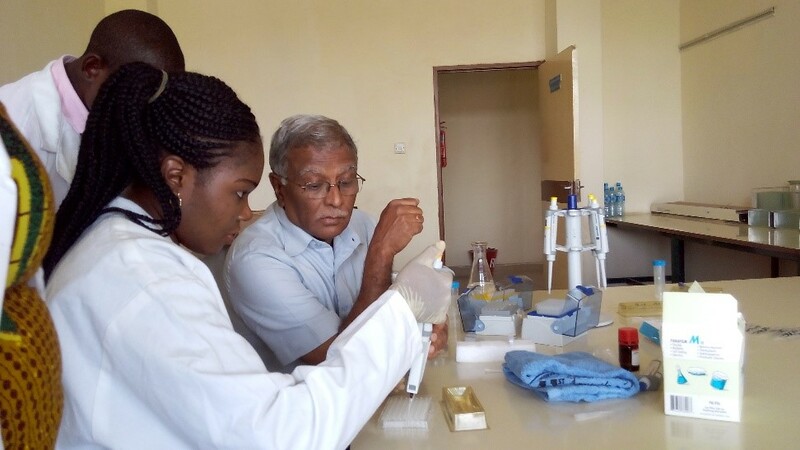 A new improved method to detect aflatoxin in groundnuts, developed by ICRISAT, can save lives and open export markets for African and Asian countries. The devise is faster, the first ever to be mobile as well as having a low cost for undertaking the tests. The aflatoxin detection test is simple to perform and can detect contamination at levels of 10 parts per billion (ppb) in less than 15 minutes. The compact mobile device is based on the lateral flow immunoassay test (popularly known as the strip test as used in a glucometer). If aflatoxin is present in the sample, then one pink line appears on the strip, whereas if the sample doesn’t have any aflatoxin, two pink lines appear on the strip. No technical knowledge or training is required to use the kit. For example, it can be used by traders to check for contamination before concluding a sale. The rapid detection is useful for public health authorities to be able to identify suspected samples in cases of an outbreak of aflatoxin poisoning. It is expected that the kit can be made available for less than US$ 2. Efforts are in progress to develop a mobile sample extraction kit so that the entire process can be carried out in the field. It is expected to be ready in the next two months. The kit was developed by Dr S Anitha, Special Project Scientist, ICRISAT-Malawi. 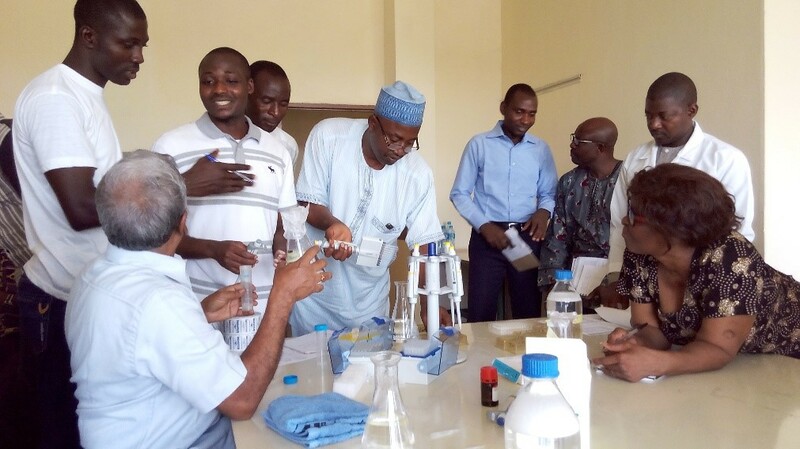 Towards creating awareness about aflatoxin, its prevention and detection in the groundnut and sorghum value chain programme of the Federal Government of Nigeria, ICRISAT helped set up two aflatoxin detection and quantification laboratories — at the Institute for Agricultural Research (IAR)/Ahmadu Bello University (ABU) Zaria, and the Federal University of Agriculture (FUAM), Makurdi. These will serve as aflatoxin detection centers in groundnut, sorghum and other grains and food, facilitating aflatoxin related research and learning by students, academic staff and other researchers, while ensuring that the food is safer for consumption and export. Nigeria was once the world’s leading groundnut exporters in the 1960s with the crop accounting for about 70% of the country’s total export earnings. Since then, efforts have been ongoing to revive the groundnut pyramids of Kano. The project is evaluating the prevalence of aflatoxin contamination in the soils of the target districts, as well as in maize and groundnuts stored at the household level (immediately after harvest and again just before planting of the next season), and at key points in the value chains of each crop. This also involves training on pre- and post-crop handling to mitigate aflatoxin levels to the UBALE staff, Ministry of Agriculture staff (AEDOs) and lead farmers. A training manual titled “A guide for extension workers on how to reduce aflatoxin contamination in groundnuts and maize” was produced, containing detailed information on aflatoxin, its effects on human beings and the economy, factors influencing contamination, and pre- and post-harvest practices to mitigate contamination. 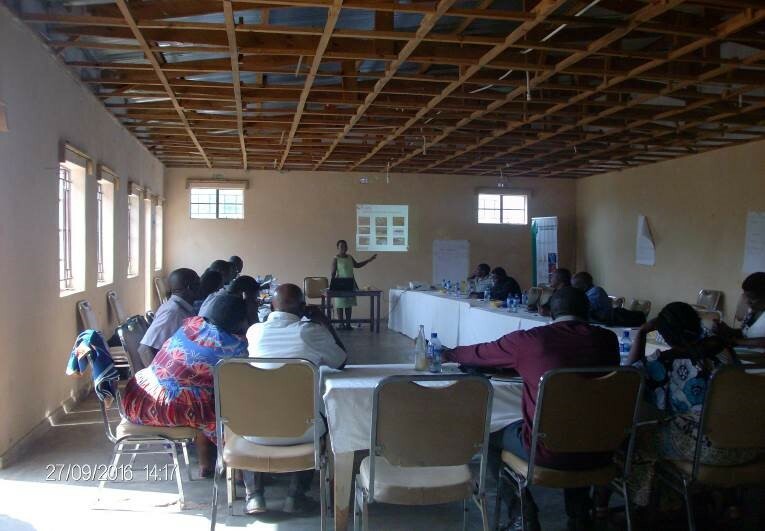 The manual was used to train trainers from the Government of Malawi and NGO staff. A two-day training on simple aflatoxin mitigation technologies was conducted for 26 trainers (7 women and 19 men) of lead farmers at Blantyre. The participants were from government and non-government institutes including Catholic Relief Services (CRS), Save the Children, Care, Catholic Development Commission in Malawi (CADECOM), and the Ministry of Agricultural and Food Security (MoAFS). They received training especially on grading groundnut and maize grains and identifying unhealthy grains including discolored, shrivelled, rotten and insect-infested grains. ICRISAT is investigating whether raising awareness in marketing associations on the constraints that aflatoxin poses to marketability, results in improved practices for aflatoxin control, and better prices for aflatoxin-free products. 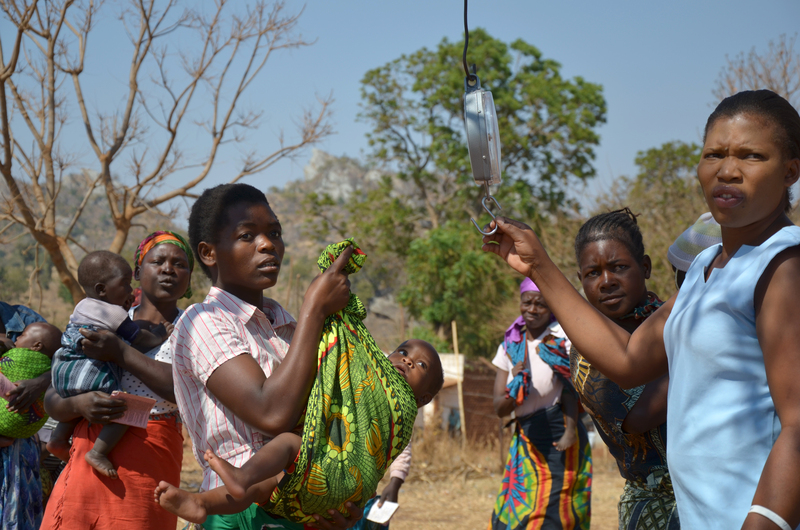 This research provides an important bridge between USAID’s FtF agenda and its Food for Peace activities, including opportunities for the work in Malawi to inform practice elsewhere around the world. The research will build on the baseline aflatoxin levels determined as part of the capacity building work, and take place during the 2018/2019 season. A new research project “Identification of markers and genomic regions associated with aflatoxin resistance in groundnut “was launched to identify the genomic regions and genes associated with aflatoxin resistance in groundnut using a combination of genomics approaches. One of the main objectives of the new project is to validate the identified genes and develop diagnostic markers so that they can be deployed in molecular breeding for developing superior lines with enhanced aflatoxin resistance in addition to other desired agronomic and productivity traits. The project ‘Identification of markers and genomic regions associated with aflatoxin resistance in groundnut’ is funded by the Mars Inc., USA, for a period of three years.